Amber Trails Community School | prairie architects inc. This award winning school is located in one of Winnipeg’s newest and expanding neighbourhoods in north Winnipeg at 1575 Templeton Avenue, the Amber Trails Community School in the Seven Oaks School Division officially received LEED Platinum designation on December 7th, 2016. This is the first school in Manitoba to be certified LEED Platinum, and only the second in Canada following the lead of the Dr. David Suzuki Public School in Windsor, Ontario. Built with provincial funding through the Public Schools Finance Board and guided by the principles of the Seven Oaks School Division to reduce overall operating costs, the school has achieved an overall energy use reduction of 68% less than a model building, exceeding energy use expectations while simultaneously achieving over 60% water reduction (10% over the estimated savings). 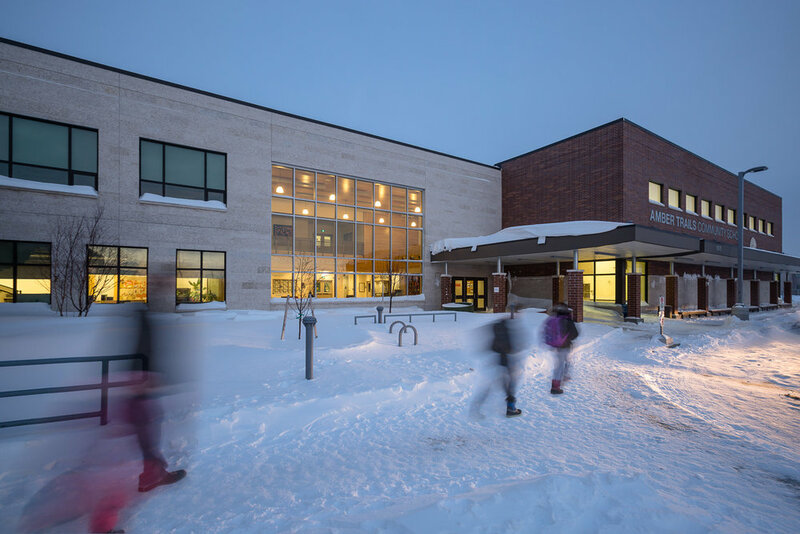 Originally targeting LEED Gold; geothermal heating, in-floor heating, and efficient lighting fixtures further helped reduce the energy needs of the school and achieve higher certification. Prairie Architects Inc. worked with the Public Schools Finance Board and Seven Oaks School Division in the design of a birth to Grade 8 school as a sustainable prototype for other similar schools in Winnipeg. The new school is situated in the heart of the community, and challenges existing paradigms about school design and creates exciting new visions for education. 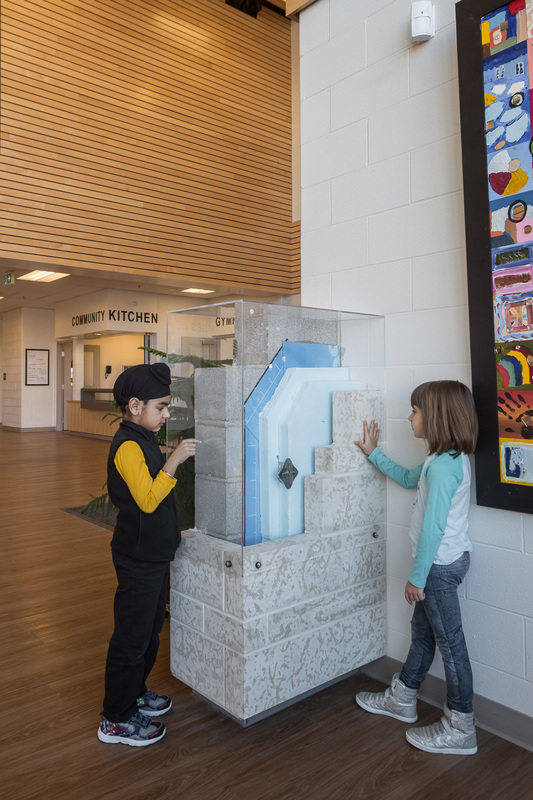 The design focused on creating a comfortable inclusive environment; with a welcoming entrance, which encourages new-to-Canada parents and grandparents to connect with others in their community, natural daylight filled learning spaces, flexibility for different learning opportunities, fusion of inside and outside environments, common learning centres, outdoor classrooms, and connection to the community. The stakeholder group established goals that the school was to meet. One such goal was to create a design that would facilitate an open and easily accessible facility for community use, and act as a community hub to be connected to the community’s network of walking trails. Keeping light pollution from trespassing into neighbouring homes and the night sky was also a key goal for the school which is closely bound by the residential neighbourhood. Also, it was important that the school contribute to a healthy learning environment for students and staff, which was achieved through elements such as access to natural light, views to the outdoors, and air quality testing prior to building occupancy. The new neighbourhood in which the school is a part of, was planned anticipating that the school would become the community centre and public library for the area. As such, the school was designed with public access in mind and incorporates large glass walls and entrances facing onto the street opening into to the large entry and learning commons, as well as the gymnasium and kitchen. This design requirement challenged the typical design notion that the gymnasium should be a windowless, large mass tucked at the back of a school. Instead, the design of the new Amber Trails Community School, demonstrates that these new prototype school facilities are open and accessible to all, with the vibrant glow of activities spilling out through the windows on many dark, Winnipeg winter nights. To lessen the impact on children going to school in such a large facility, the academic spaces are broken down and designed as ‘schools within a school.’ Four ‘academies’ of 150 students each; are the home base for the students throughout their time at the school. A day care and early learning centre is anchored within the school and benefits from shared access throughout. Three levels of outdoor play have been designed: an exterior courtyard off of the early years classrooms for intensive play; a semi public zone around the school providing active play centres for middle grade children; and a public area which connects into the trails of the community and provides a fitness trail for all. Amber Trails School is the recipient of The Canadian Green Building Award - Institutional [Large] (2017), Excellence in Green Building (New Construction) (2017), and the CaGBC's Greenest School in Canada (2017) awards. Watch the winning entry video created by the Amber Trails Community School here! Read about Amber Trails Community School in Canadian Architect!